Ever wanted to change the look of your device, or wish your phone came in a different color or finish? Carbon Armor gives you the ability to change the look of your device without having to break the bank. Applied without any liquids, Carbon Armor provides scratch proof protection while also giving your phone a unique stylish look, as well as the feel of real carbon fiber on your device. No more worrying about having to buy a bulky case, painting, or voiding any warranty just to change the look of your device. 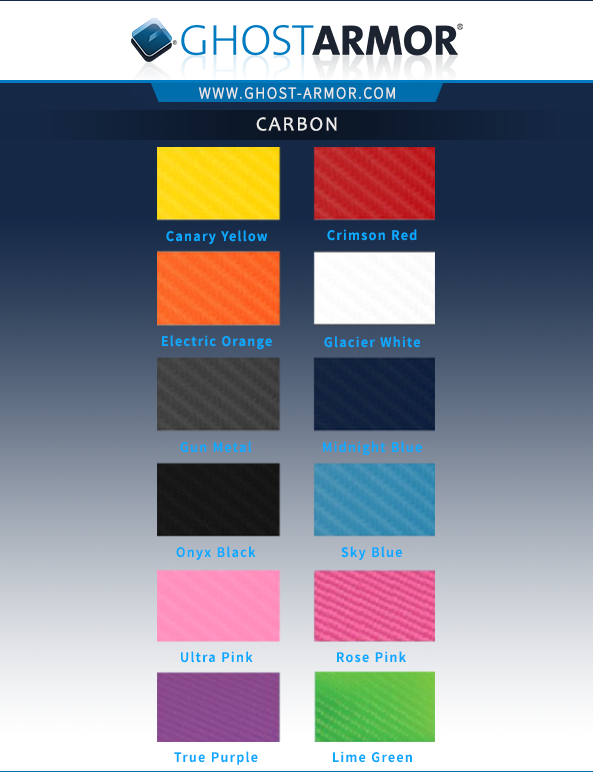 Carbon Armor comes in various colors. Carbon Armor offers that same great scratch proof protection that the Clear and Matte Finishes do, while giving your device a personal touch. Full Body protection kits ordered on-line, will ship with a Ghost Armor Clear Screen protector (excluding Laptops). So whether you want to change the color of your phone or maybe add the look and feel of carbon fiber, Ghost Armor has you covered.